Acidification of ocean surface waters by anthropogenic carbon dioxide (CO2) emissions is a currently developing scenario that warrants a broadening of research foci in the study of acid–base physiology. Recent studies working with environmentally relevant CO2 levels, indicate that some echinoderms and molluscs reduce metabolic rates, soft tissue growth and calcification during hypercapnic exposure. In contrast to all prior invertebrate species studied so far, growth trials with the cuttlefish Sepia officinalis found no indication of reduced growth or calcification performance during long-term exposure to 0.6 kPa CO2. It is hypothesized that the differing sensitivities to elevated seawater pCO2 could be explained by taxa specific differences in acid–base regulatory capacity. 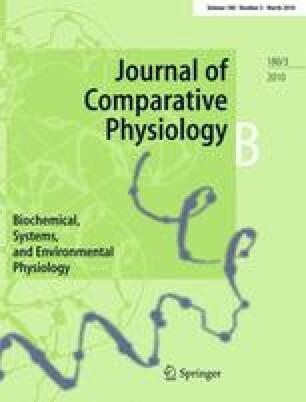 In this study, we examined the acid–base regulatory ability of S. officinalis in vivo, using a specially modified cannulation technique as well as 31P NMR spectroscopy. During acute exposure to 0.6 kPa CO2, S. officinalis rapidly increased its blood [HCO3 −] to 10.4 mM through active ion-transport processes, and partially compensated the hypercapnia induced respiratory acidosis. A minor decrease in intracellular pH (pHi) and stable intracellular phosphagen levels indicated efficient pHi regulation. We conclude that S. officinalis is not only an efficient acid–base regulator, but is also able to do so without disturbing metabolic equilibria in characteristic tissues or compromising aerobic capacities. The cuttlefish did not exhibit acute intolerance to hypercapnia that has been hypothesized for more active cephalopod species (squid). Even though blood pH (pHe) remained 0.18 pH units below control values, arterial O2 saturation was not compromised in S. officinalis because of the comparatively lower pH sensitivity of oxygen binding to its blood pigment. This raises questions concerning the potentially broad range of sensitivity to changes in acid–base status amongst invertebrates, as well as to the underlying mechanistic origins. Further studies are needed to better characterize the connection between acid–base status and animal fitness in various marine species. The online version of this article (doi: 10.1007/s00360-009-0412-y) contains supplementary material, which is available to authorized users. This study was supported by a Fulbright Fellowship (MAG), the AWI ‘MARCOPOLI’ Program (MAG, FM, ML, FJS, CB, HOP), and the DFG Excellence Cluster ‘Future Ocean’ (FM, ML). We extend our thanks to R. Wittig for NMR data analysis. This work is a contribution to the German Ministry of Education and Research (BMBF) funded project “Biological Impacts of Ocean ACIDification” (BIOACID) Subproject 3.1.3 and the “European Project on Ocean Acidification” (EPOCA) which received funding from the European Community’s Seventh Framework Programme (FP7/2007-2013) under grant agreement n° 211384.